Buying a projector is not an insignificant investment, so you'll want to think carefully about how you're going to use the projector so you can match the features you need at the best price point. 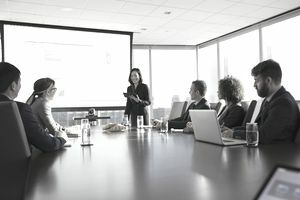 For instance, a projector's brightness is a key buying factor, but if you're not planning to frequently give presentations in large conference rooms or classrooms, you may not need high performance in this area. These key buying factors will help you choose a projector for your business. LCD (Liquid Crystal Display) and DLP (Digital Light Processing) are the competing projection technologies similar to those used on TV sets. Manufacturers tend to favor either LCD or DLP; for example, BenQ uses DLP technology whereas Epson's projectors are LCD. SVGA (800 x 600), XGA (1024 x 768), 1080P (Home Theatre), WXGA (1280 x 720 Widescreen), SVGA (1280 x 1024) or UXGA (1600 x 1200) ? The higher the projector's resolution, the higher the price. If you will use your LCD projector mainly for PowerPoint presentations, the SVGA resolution will be fine, while XGA is a good choice for displaying numerical data. You'll only need the higher resolution LCD projectors if you need fine details to be accurately displayed. If you mainly need to display high definition video from HDTV broadcast or Blu-Ray media then a 1080P (Home Theatre) projector might be preferable. Note that where possible it is best to match the projector resolution with the input device resolution - for example, if you typically use a widescreen laptop to connect to your projector the best results will be obtained with a projector that uses the same display resolution, otherwise the displayed image will be scaled to match the resolution of the projector and the results may not be satisfactory. The higher the ANSI lumens rating, the brighter the LCD projector's light output. Projectors of 2500-3000 lumens put out enough light for normal business or classroom situations, while projectors of 3000-4000 lumens produce enough light to illuminate images without washout in large conference rooms and classrooms. For auditoriums, halls, and other larger rooms a projector of 4000 lumens or more is preferable. Projector contrast is expressed as a ratio between the brightest and darkest areas of the image. In general, the higher the contrast ratio the clearer the graphics and video images will be. You'll want to choose an LCD projector with a very high contrast ratio if you plan to frequently project images with the lights on. Projector weight is a portability issue; if you're going to be carrying the projector around a lot, making presentations in different locations, the lighter the better. There are now many projectors available that weigh less than 5 pounds, which can lighten your load considerably if you're a mobile presenter. However, generally, the lighter the projector the more it costs. If you want something really portable there are tiny, battery-powered projector units available which can be connected to your smartphone. These are perfect for presentations to small groups of people. Some smartphones are even available with projectors built into the phone. When you buy a projector, you'll choose one that connects to the computer or video source you normally use, of course. But will you always use the same computer or video source? You may need a separate connector cable or adapter in some cases. Check to see if the projector has multiple interface ports (USB, HDMI, Network, Composite Video, etc.) to accommodate your needs in terms of being able to connect different video sources to the projector. Some manufacturers such as Epson offer WiFi connectivity so no direct cabling is required. The image from the computer screen is transmitted via WiFi to the projector. Another factor you may want to consider when buying a projector is the listed lamp life, as replacement lamps can cost hundreds of dollars. For a non-LED projector, a listed lamp life of 3000 hours or more is excellent. Some projectors come with mode choices, such as "eco-mode" that allow extended lamp life, and cut down on operating costs. Projectors that use LEDs as a light source are designed to never need lamp replacement.